From the Home screen, swipe the Navigation bar to the left and tap Newsstand. 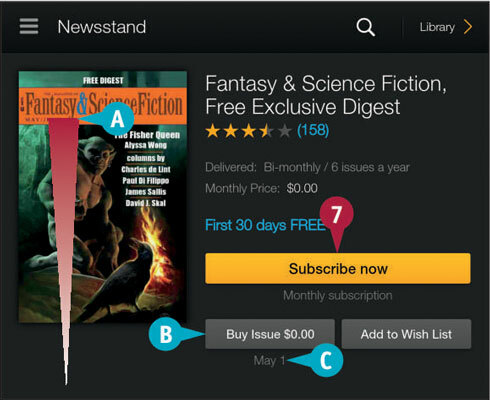 If you have not yet purchased publications, the Newsstand content library automatically displays the online storefront. If you own publications and want to shop, tap Store in the upper-right corner of the screen. Tap the Search button to search for a publication (see 2 in the image). Type a search phrase. From the list of suggestions, tap a phrase (like the one indicated by the 3). 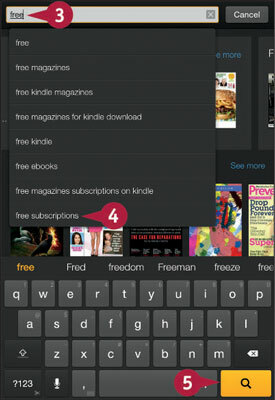 This example uses free subscriptions (indicated by the “4”). The Search button is indicated with a “5” in the image. Tap the Search button on the bottom right of the screen. The results of your search appear (see 6 in the image). The product page for the publication appears. You can swipe up to scroll down and review details (A). If single issues are available and you want to buy the available issue, tap Buy Issue (B). The available issue appears below the button (C). Tap Subscribe now (see #7). The publication downloads to your Fire tablet. 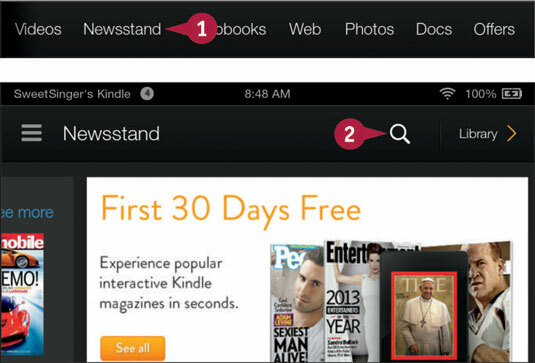 A link to the publication appears in the Newsstand content library and on the Home screen’s Carousel.